I am sitting motionless in the middle of nowhere. It seems that I have no body, I am just an embryo still attached to the Universe by an invisible cord. I am embraced by silence and emptiness, floating in the dark peaceful ocean. Time is far away and a second lasts like a century. And suddenly my empty skull is filled with a sound of a soft human voice which asks us to open the eyes. Slowly I obey though the imaginary world is too marvelous to abandon. I come to myself in the meditation room of a hotel lost in the mountains of Georgia. Despite the fact it is 6 a. m. my mind is crystal clear and my body anticipates morning yoga workshop. I discovered the “Peace in, Peace out” movement by pure chance but it resembled a glass of water for a man dying in the desert. After having taught English in a provincial town day after day for 6 months I felt sore and burnt out. The whole world looked hostile and menacing, ready to collapse on my shoulders and bury under a pile of troubles. I was tense like a string and boiling like a volcano about to erupt. It was meditation that opened the gate to the new world. Each new session cured my exhausted spirit. The effect resembled a seed thrown in the very depth of my soul. It grew steadily and one day turned into a huge bloom, shining like a rainbow. It was so powerful that left no space for the weeds of anger, jealousy or vanity. It was so fragile that a single crossed word could damage its stem. Later I learnt the right term for the flower: Inner Peace. Four months after my first meditation practice I found myself in the village of Bakhuriani far away from threats and rush of civilization. My mobile phone, walkman and laptop lay forgotten and neglected. I needed the gadgets no more than a newborn child. Here I was, indeed, born again as a Peace Rebel. Having been blinded by ghosts of wealth and success I regained vision and was wondering at splendors and treasures of the world around. Every day in Bakhuriani was structured and unique at the same time. Twenty five young Peace Rebels met the sunrise in the meditation room. The reality was vague and dim like the mist, covering mountain peaks. The peaceful voice of the Teaching Monk came from the mysterious world of half-dream. Its lullaby comforted and consoled us. Each day we meditated four times and then left feedback, trying to describe daily experience as precisely as possible. 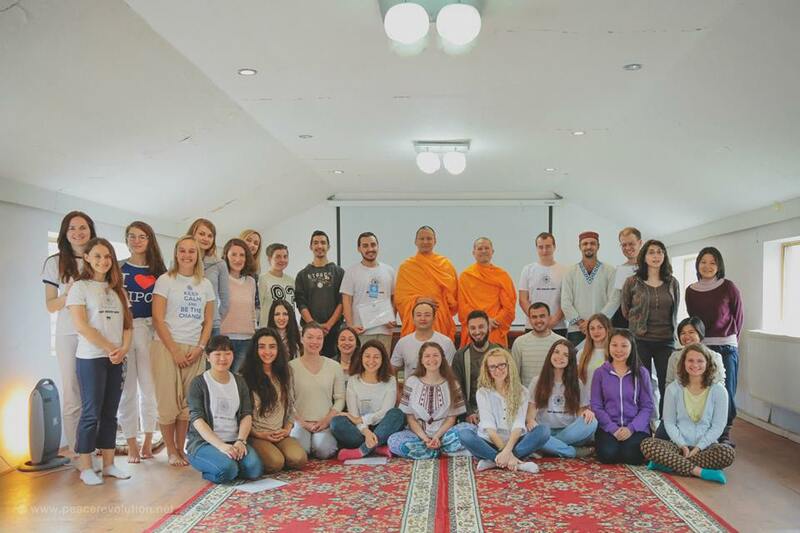 The task was not easy: how to find the right words to express all the complexity of feelings caused by group meditation – a combination of divine peacefulness and youth energy? Yet we did our best to explore the maze of the inner world. And the better I orientated in the world of my thoughts, emotions and ambitions the easier it was to contact the real world. Before I used to live in the web of cravings and desires and looked forward to owning more. Never was I satisfied with the current amount of money, knowledge and experience. However, The Bridge Fellowship made me willing to share and cherish, give a helping hand to people in need. Surprisingly, this determination cost me little effort and in return I felt the freedom of a released prisoner. Indeed, the chains of self-centeredness were broken. I was a giant able to hug the whole humanity. “PEACE IN, PEACE OUT, PEACE REVOLUTION”. Previous PostPrevious Indra’s Net: Recognizing our Interdependence.